Sick in hospital at Annapolis, MD May 1863. 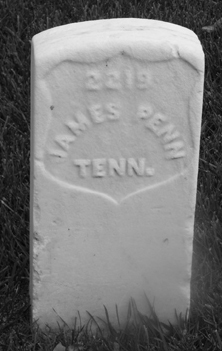 James, Pleasant and Richard Penn were brothers and sons of Stephen C. Penn and Esther Hettie Day and grandsons of Stephen Penn and David Day, Jr. They were cousins to George, John and Stephen Penn who also served in this regiment. After the war James married Sallie Pettus. James Penn's Civil War records show for Dec. 1862, he was absent with leave with wagon train since Dec. 27th. He was reported missing at Day's Gap, AL April 28, 1863, but was able to rejoin his company and was captured at Cedar Bluff. He was exchanged and sent to the hospital at Annapolis in May, 1863. The nature of his injury or illness is not stated in the records. He remained in the Annapolis hospital at least through June 1865. No discharge date is listed on his record. He returned home to marry Sallie Pettus. Picture submitted by Nancy Bramucci Sheads.